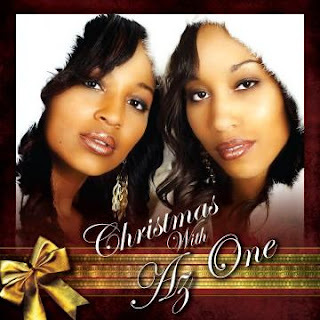 On December 4, the sister duo Niambi and Ayanna of Az One released their holiday album entitled, Christmas with Az One. This is a combination of classic Christmas songs with an R&B and Blues spin. Their music will remind listeners of the early 90's sensation, En Vogue. Although they have that 90's feel, they are still very modern. In 2010, expect big things from Az One with their newest CD coming soon. They recently released their newest hit single, "Eyez on Me" as a preview of what's to come. This song is a catchy hip-hop jam fit for the club or just cruising. Be on the look out for their newest release coming out soon. You and your sister have been performing for nearly eight years. How did it all start? It started in college. Ayanna was at her summer job and wrote our first song, "Be With You". We both went back to school the next semester and recorded it in our friend's dorm room. It hasn't stopped since then. So, what have been some of your major accomplishments to date? One, we released our first independent album, The Jump Off. We wrote and arranged every song on the album and funded it our self. It was a great success and we are very proud of it. Two, we performed on the live and national TV show 106 & PARK on BET twice and won the R&B competition for their Wild Out Wednesday competition. And right now we are so proud of our Christmas album, Christmas With Az One. It's something we have been wanting to do for a few years now and finally got it done this year! Did church play an important roll in your musical career? What was your motivation for lyrics in your music? Our lyrics come from real life situations and also the musical track can put you in a certain mood. When a track comes, you can feel what you want to write about. It may put you in a serious mood or a party mood. Who are some of your influences in the music industry? We grew up listening to all type of music. But we love Patti Labelle, Whitney Houston, Micheal Jackson, and Tupac. Artists who make timeless music. There are too many to name. I see that both of your graduated at Southern Illinois University. Do your degrees differ from your music career? Are you applying your education into music, in a business sense? Yes, you have to be smart to make your music career a business. We apply our knowledge we obtained in school to help build our career. Has it been a challenge making a name for yourself in today’s market? Very challenging. Especially when we both work full time jobs. We have to constantly push and prove our self. Basically we have to promote everywhere we go. It's not a day that goes by that we are not doing something with music. It's very hard since we don't have a big name behind us or a big budget. Is the industry making it hard for independent artists like your self? There are so many good artists out here trying to do the same thing. In the industry now, sometimes it's not all about the talent. It's about who you know and how much money you have. Most companies don't accept unsolicited material. A lot of people want you to pay to open up for big names. Bottom line you got to keep yourself one step above and just flood flood flood the industry until they can't help but notice you. With the ease of technology, is it easy to create music the way you want it to sound? All the new technology out there is great! But you still have to have a professional who knows how to use it and get the sound you want. Have you been approached by any record labels or executive record producers? Yes, we have been approached by a couple, we submitted our info as they asked but we are still knocking! It looks like you’re attending a talent and fashion show for Military families at The Shrine in Belleville, IL on Dec 18th. Are you doing a singing performance there or are you modeling as well? What is in store for Az One? In the new year of 2010 we will continue to push and promote the name of Az One. We will be releasing some new music! So get ready!! To find out more information on Az One, go to their MySpace page or their Az One website. How correctly said there is no dirt of talent in the music industry but talent alone cannot guarantee success you need to have huge sums of money to there for back up. Also sometimes the songwriter in the new music business can be quite important.